0830Hrs: Back to the Lodge for breakfast. 1600Hrs: 2hr evening game drive at the Amboseli National Park. 0700Hrs: Leave Amboseli and head for Nakuru National Park. 1300Hrs: Lunch is served at Lion Hill Lodge in Nakuru upon arrival. 1600Hrs: Enjoy a 2hr afternoon Game Drive in Nakuru National Park. 1800Hrs: Drive back to Lion Hill Lodge for dinner and overnight. 0630Hrs: Leave the Lodge for your morning game drive. 0830Hrs: Drive back to Sarova Lion Hill Lodge for breakfast and checking out. Drive to Naivasha. 1200Hrs: Arrive at Naivasha Simba Lodge just in time for check in and lunch. 1430Hrs: Enjoy a 1hr boat ride at Lake Naivasha. 1730Hrs: Drive back to Naivasha Simba Lodge for dinner and an overnight stay. 1200Hrs: Lunch will be served upon arrival and check-in at Sarova Mara Lodge. 1600Hrs: Enjoy your afternoon Game Drive which runs for 2hrs. 1800Hrs: Drive back to Sarova Mara Lodge for dinner and overnight. 0630Hrs: Your 2 hrs morning Game Drive begins. 1800Hrs: Drive back to Sarova Mara for dinner and overnight. 1230Hrs: Arrive at a Kisumu Restaurant for your lunch. 1430Hrs: Drive to Kisumu Museum and Impala Park for a City. 1800Hrs: Drive to Imperial Hotel for dinner and overnight. 1230Hrs: Enjoy a Picnic Lunch at the Kit Mikayi. 1600Hrs: Return to Kisumu for a Boat ride in Lake Victoria. 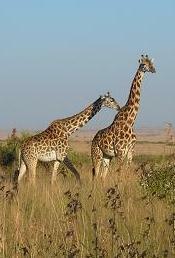 1000Hrs: Pick up from the Airport and proceed to Giraffe Center or David Sheldric animal Orphanage for a visit. 1230Hrs: Arrive at carnivore restaurant for your sumptuous BBQ lunch. 1500Hrs: Drive to the airport for your flight out of East Africa. 1600Hrs: Enjoy your first 2hr afternoon Game Drive in Amboseli. 1800Hrs: Drive back to lodge for dinner and overnight. 1300Hrs: Lunch is served upon your arrival at Sarova Mara Lodge in Maasai Mara. 1600Hrs: Enjoy a 2 hr Game Drive in the Mara. 1800Hrs: Drive back to the Lodge for dinner and overnight. 0700Hrs: Leave Sarova Mara Lodge for Nairobi. 1200Hrs: Arrive at the Carnivore restaurant for a sumptuous BBQ lunch. 1500Hrs: Transfer to Jomo Kenyatta International Airport for flight back home. 1300Hrs: You will be served lunch upon arrival and after normal check-in procedures. 1600Hrs: Enjoy a 2hr Game Drive at Amboseli. 1800Hrs: Drive back to Amboseli Serena for dinner and overnight. 1330Hrs: Lunch is served at Aberdare Country Club in Nyeri upon arrival. 1430Hrs: A separate vehicle transfers you to The Ark Tree Hotel for the night. 1500Hrs: Arrive at The Ark for game viewing, tea, dinner and overnight stay. 0730Hrs: Leave The Ark for Aberdare Country Club. 0830Hrs: Arrive at Aberdare Country Club to meet your Tamasha Afrika driver. 0900Hrs: Leave Aberdare Country Club for your drive to Nakuru National Park. 1200Hrs: Lunch will be served at Lion Hill Lodge in Nakuru Upon arrival. 1600Hrs: Enjoy a 2hr Game Drive in the park. 1800Hrs: Drive back to the Lion Hill Lodge dinner and overnight. 1230Hrs: Lunch is served at Sarova Mara after arrival and check-in. 1600Hrs: A 2 hr afternoon Game Drive follows your rest after lunch. 0630Hrs: Enjoy a 2 hr morning game drive. 0830Hrs: Drive back to the Sarova Mara where breakfast awaits. 1600Hrs: The 2 hr afternoon Game Drive commences. 1230Hrs: Arrive at the Carnivore restaurant in Nairobi for a fabulous BBQ lunch. 1500Hrs: You are driven to the airport to catch your flight out of Kenya. 1200Hrs: Lunch is served at the Aberdare Country Club upon arrival. 1300Hrs: You will change vehicles and be transferred to The Ark Tree Hotel. 1330Hrs: Arrive at The Ark Hotel for tea, Game viewing, dinner and overnight stay. 0700Hrs: Leave The Ark Hotel for Aberdare Country Club. 0730Hrs: Arrive at Aberdare Country Club and meet your Tamasha Afrika driver. 0800Hrs: Leave Aberdare Country Club for Samburu National Reserve. 1300Hrs: Arrive in time for lunch at Samburu Simba Lodge. 1600Hrs: Enjoy a 2hr Game Drive at Samburu. 0630Hrs: Morning Game Drive starts and will last for 2 hrs. 0830Hrs: Drive back to lodge for breakfast. 1600Hrs: Your 2hr afternoon Game Drive starts. 1800Hrs: Drive back to the Lodge for dinner and overnight at Samburu Simba Lodge. 1230Hrs: Arrive at Sarova Lion Hill Lodge where lunch is served after check-in. 1600Hrs: A 2hr Game Drive in Nakuru follows the afternoon rest. 1800Hrs: Drive back to Sarova Lion Hill lodge for dinner and overnight. 1600Hrs: Enjoy an afternoon Game Drive at the famous Maasai Mara. 0830Hrs: Arrive at Naivasha for a 1hrs boat rides in the lake Naivasha. 0930Hrs: Leave Naivasha for onward trip to Lake Nakuru National park. 1200Hrs: Arrive at Lion Hill Lodge in time for lunch upon check-in. 1600Hrs: Enjoy a 2hrs Game Drive around the Lake. 1800Hrs: You are driven back to the Lodge for dinner and overnight. 1230Hrs: Lunch is served on arrival and after the check-in procedures. 1600Hrs: A 2 hr Game Drive follows after a well-earned rest. 0830Hrs: Breakfast is served at the restaurant on your return from the Game Drive. 1600Hrs: An afternoon Game Drive around the park keeps you entertained for 2 hrs. 1230Hrs: Lunch will be served on arrival at the Stanley hotel in Nairobi. 1330Hrs: Drive to the Wilson Airport for flight to Mombasa which leaves at 1400Hrs. 1500Hrs: Upon arrival in Mombasa you will be driven to your Mombasa Serena Beach Hotel. 1800Hrs: Dinner and overnight at the Mombasa Serena Beach Hotel. 0900Hrs: Flight leaves for Nairobi. 1000Hrs: You will be picked up from the Jomo Kenyatta Interenational Airport upon arrival. 1200Hrs: Enjoy a sumptuous BBQ lunch at the Carnivore restaurant. 1500Hrs: You are driven to the airport for your flight out of East Africa. 1230Hrs: Lunch will be served after check-in at the Amboseli Serena. 1600Hrs: Enjoy your first afternoon Game Drive at Amboseli. 1800Hrs: Drive back to Amboseli Serena Lodge for dinner and overnight. 0630Hrs: Breakfast is served at the Lodge's Restaurant. 0700Hrs: Leave Amboseli for Nakuru via Nairobi. 1200Hrs: Arrive at the Tamambo Restaurant for Lunch. 1300Hrs: Leave Tamambo Restaurant drive on to the Nakuru National Park. 1600Hrs: Arrive at Nakuru National Park and Proceed with an afternoon Game Drive. 1800Hrs: Check-in to the Lion Hill Lodge for dinner and overnight. 0630Hrs: Breakfast is served at the restaurant. 0700Hrs: Leave Sarova Lion Hill Lodge for the Maasai Mara. 1230Hrs: Arrive at the Sarova Mara in time for lunch after check in Procedures. 1600Hrs: Enjoy for first Game Drive at the Mara. 1800Hrs: Back to the Lodge for dinner and overnight. 0630Hrs: Drive out for your second Game Drive after a cup of tea or coffee. 0830Hrs: Breakfast is served after your return from the Game Drive. 1600Hrs: Leave for your afternoon Game Drive for the day. 1800Hrs: Drive Back to the Mara Sarova for dinner and Overnight. 0700Hrs: Leave Sarova Mara for drive back to Nairobi. 1230Hrs: Arrive at the Carnivore restaurant in and enjoy a sumptuous BBQ lunch. 1430Hrs: Drive to the airport to catch your flight out of East Africa. 1400Hrs: Change buses and leave the Aberdare Country Club for the Ark. 1430Hrs: Arrive at The Ark where you will have leisure time until dinner time. 1930Hrs: Dinner is served followed by a whole night of game watching. 0800Hrs: Leave The Ark, drive to Aberdare Country Club. 0900Hrs: Leave Aberdare Country Club, drive to Lake Nakuru National Park. 1200Hrs: Proceed to Sarova Lion Hill Lodge on arrival at Lake Nakuru. 1230Hrs: Lunch is served at the lodge after check in. 1600Hrs: Enjoy a 2hrs game drive in the park. 1800Hrs: Drive back at Sarova Lion Hill Lodge for dinner and overnight stay. 0700Hrs: Leave Sarova Lion Hill Lodge drive to Maasai Mara. 1230Hrs: Lunch is served at the Mara Simba lodge after check in. 1600Hrs: Enjoy a 2hr afternoon game drive in the Maasai Mara Game Reserve. 1800Hrs: Drive back to the Lodge for Dinner and overnight stay. 0630Hrs: Enjoy a 2hr morning game drive. 0830Hrs: Drive back to the lodge where breakfast awaits. 1230Hrs: Lunch is served at the Lodge followed by leisure time until 4pm. 1600Hrs: Enjoy a 2hr afternoon game drive. 1230Hrs: Arrive in Nairobi, enjoy lunch at Carnivore Restaurant. Drive to the airport. 1230Hrs: Lunch is served at the Sarova Mara upon arrival. 1600Hrs: Enjoy a 2hrs afternoon Game Drive at the Mara. 1800Hrs: Drive back to the Sarova Mara for Dinner and overnight stay. 0630Hrs: Enjoy a Morning game drive. 0830Hrs: Drive back to Sarova Mara for breakfast followed by leisure time. 1230Hrs: Lunch served at the Lodge. 0730Hrs: Leave Maasai Mara, drive back to Nairobi. 1230Hrs: Arrive at Carnivore Restaurant for a BBQ lunch. Drive to the airport to catch your flight back home. 1600Hrs: Enjoy a 2hr game drive at the Amboseli National Park. 0800Hrs: Leave Amboseli Serena Lodge, drive back to Nairobi. 1230Hrs: Arrive in Nairobi, enjoy a BBQ lunch at Carnivore Restaurant. Drive to the airport. 1230Hrs: Lunch is served at the Amboseli Serena Lodge upon arrival. 1600Hrs: Enjoy a 2hr afternoon Game Drive at the Amboseli. 0830Hrs: Drive back to the Lodge for breakfast. 1230Hrs Arrive in Nairobi, lunch served at Carnivore Restaurant. 1500Hrs: Transfer to the Airport for your departure flight. 1900Hrs: Dinner and overnight stay. 0800Hrs: Depart to The Ark. 1230Hrs: Arrive at the Aberdare Country Club in time for lunch. 1400Hrs: A transfer bus drives you to The Ark. 1930Hrs: Dinner and overnight stay at The Ark. 0800Hrs: Leave The Ark, drive back to The Aberdare Country Club. 0830Hrs: Leave Aberdare Country Club, drive to Nakuru. 1230Hrs: Arrive at Sarova Lion Hill Lodge in Nakuru for lunch. 1600Hrs: Enjoy a 2hr game drive at Nakuru. 0800Hrs: Depart Nakuru National Park for Maasai Mara National Reserve. 1300Hrs: Arrive at Mara Simba Lodge in time for lunch. 1600Hrs: First game drive at Maasai Mara. 0630Hrs: Depart for Morning game drive. 0830Hrs: Drive back to Mara Simba Lodge for breakfast. 1800Hrs: Back to the Lodge for Dinner and overnight stay. 1300Hrs: Arrive at Sankara Hotel in Nairobi for lunch. 1430Hrs: Drive to the nearby Sankara Hotel. Check in. 1930Hrs: Dinner on own. Overnight stay at Sankara Nairobi. 1230Hrs: Arrive at Amboseli Serena Lodge, check in for lunch. 1500Hrs: Enjoy an afternoon game drive runs until 1830hrs. Dinner and overnight stay at Amboseli Serena Lodge. 1200Hrs: Arrive at Carnivore Restaurant for a farewell BBQ lunch. 1400Hrs: Drive to the airport to catch your flight back home.